Around 250 people could become part of this year’s spectacular Giants event as a search for volunteers gets underway. From Benevol stewards required to travel alongside each giant to media assistants and event ambassadors, organisers have a range of opportunities to join in ‘Liverpool’s Dream’. 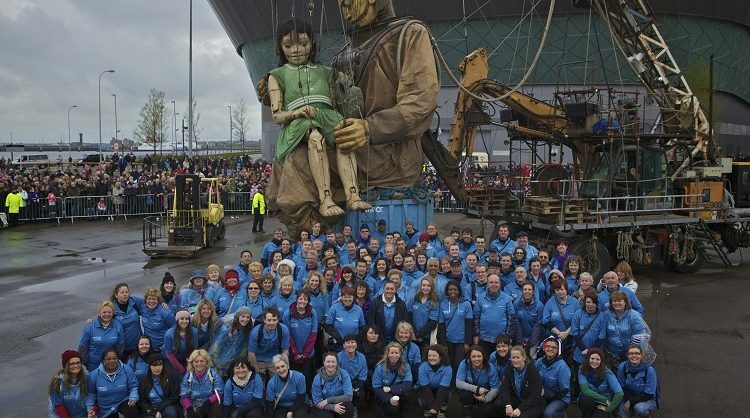 The team behind the Giants’ 4-7 October visit to the city region, which is a highlight of the Liverpool 2018 celebrations, is calling for volunteers to come forward and apply for the roles by 5pm on 31 July. Other opportunities include runners/production assistants, production drivers, translators who can speak fluent French, and physiotherapists/sports masseurs. There’s also the chance to be a Lilliputian and operate the Giants through the streets of Liverpool and Wirral, although chosen applicants will be paid for the physically challenging position due to the rehearsal time and commitment during the show that’s required. Liverpool’s deputy mayor and cabinet member for culture, tourism and events, Councillor Wendy Simon, says: “This is the final time our Giant visitors will ever walk our streets so we want to give as many people as possible the chance to be part of this event which is set to go down in Liverpool history. Anyone volunteering must be available across the four-day event, with some roles requiring commitment of several days for auditions and rehearsals during the build-up to the show. The route and details of which Giants will be heading to the city region currently remain under wraps, however Liverpool’s Princes Park and New Brighton’s Perch Rock Lighthouse in Wirral recently became the first locations to be revealed. Full role descriptions and the application details for volunteering roles can be found at www.giantspectacular.com.